craft: n. cunning: dexterity; art; creative artistic activity involving construction, carving, weaving, sewing etc. of decorative or practical objects by hand as opposed to drawing (also craftwork); a skilled trade; an occupation; skill or ability in something, esp. handiwork or the arts. This definition greeted viewers from the walls of Massachusetts College of Arts’ recent show, Crafty. Its presence acknowledged that an invisible line exists between “art” and “craft,” and the most successful pieces in the show addressed this conflict. Pieces that both suggested and denied function filled the gallery rooms. 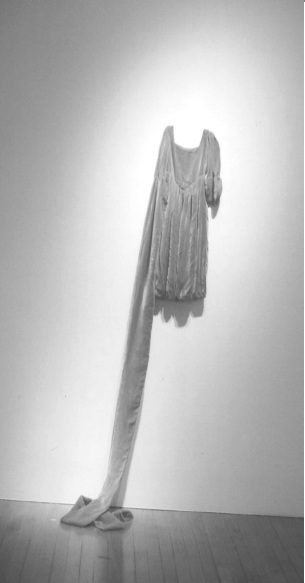 Beverly Semmes’ velvet garment, “Golden Arm,” featured an arm that extended to the gallery floor, while the leg, second arm and head holes were sewn shut. Yuken Teruya transformed paper bags and toilet paper rolls back into carefully cut forests, and Elaine Bradford’s knitted cozies covered logs that lay on the gallery floor. The latter came off as unpleasantly saccharine, perhaps because of the mysterious abundance of logs/lodge imagery and knitted items in contemporary art at the moment, but “Golden Arm” was interesting because it didn’t seem trendy, just useless. Teruya’s trees turned usable products back into what they first were, making them unusable, leaving me to wonder: Can functionality be used as a defining line between art and craft? Random House defines art as beautiful and/or more than ordinary, so why are beautiful objects in ordinary use so often excluded? Useful art has always been around in the form of quilts, spoons and furniture created by skilled artisans, but these items, united as utilitarian under the word “craft,” are not generally displayed in western art museums unless they come from ancient cultures or can be classified as design achievements. This is both disturbing and reassuring: Useful art is out circulating in the world. It is functioning to carry groceries as a silk-screened bag, or simply existing outside of the gallery, occasionally adorning a dumpster. Mass Art’s Crafty wasn’t stagnant, but it did make me feel conflicted; it was very cute (slightly repellant) and made allusions to the usefulness of art objects (slightly interesting). The best pieces in Crafty found ways to address the tension of defining “art” and “craft,” but offered no definite resolution to the tension. The line between the two still looks fuzzy to me. This entry was posted in Seeing Things, Untitled and tagged Beverly Semmes, Hannah Rieff, KS16. Bookmark the permalink.